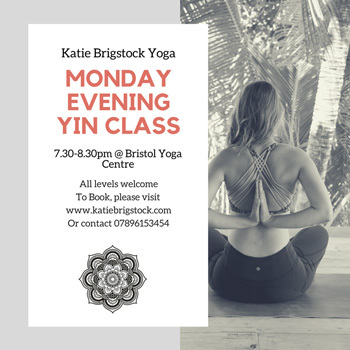 Due to a popular demand, we have decided to offer a monthly Mindful Yin Yoga workshop with Emilia and the next class is on Sunday 2nd December 10:45am - 1:30pm at the Bristol Yoga Centre. This is a real treat for the body, mind and spirit as we welcome the dark winter season. Emilia uses Mindful Yin Yoga and Mindfulness (MBSR) with elements of Restorative Yoga to create a space of allowing a deep letting go at all levels. We will complete the practice with Pranayama (breathing practice) to bring profound sense of internal balance and harmony. All levels of experience welcome. Book now with Emilia if you like to come along to the excellent yoga workshop! It's a perfect compliment to the dynamic (yang) styles of yoga like Hatha Flow, Vinyasa and Ashtanga. This class will help you discover how to use different yoga techniques to live more fully and mindfully, both on and off the mat! Contact Emilia to book for block of classes (cheaper option) or simply drop in. Here are our price details. It's also available on MoveGB!